Christmas Card sent to the Mayor. I would like to make you aware that by equating Israel and its flag with the Jewish people, you are actually promoting anti-semitism and racism, something you claim to be against. Also, with your insistence on labelling the burning of a homemade cardboard Israeli flag as an act of “hate, racism and discrimination”, you have now ensured that acts of anti-Palestinian and anti-Arab harassment will continue. Here is my “Christmas Card” to you. Note: I am still waiting for a response from you to my previous two letters! 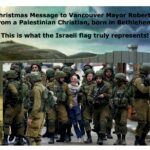 Following are two emails I have sent to Vancouver Mayor Gregor Robertson regarding the incident at one of the pro-Palestinian rallies over the weekend, which Bnai Brith has tried to characterize as “anti-Semitic”. Not only has Gregor Robertson now publicly bowed to Zionist pressure in criticizing the burning of the Israeli cardboard flag, he also crudely compared it to the heart-breaking and very personal attack on a Muslim woman on the Skytrain. Furthermore, he did not even have the courtesy to respond to our first email, let alone engage with our concerns about the harassment the rally participants faced. Send your own letter to the Mayor to express your outrage. Frankly, I am disappointed that you did not even feel we were worthy of a response or of being notified of your official statement that Bnai Brith is quoting. As we said before, we do not feel the burning of the cardboard flag was an anti-Semitic gesture. While we realize some people might find the action upsetting, to label it as “hate, racism and discrimination” is both inaccurate and inflammatory. You should know that a contingent of pro-Israel young men deliberately harassed people at both the rally on Friday night and the smaller demo on Saturday, and they were the ones who provoked any incidents that occurred. Although I was not personally at the Saturday event, I seriously doubt that the cardboard flag would even have been burnt at all if the taunting and harassment from these provocateurs had not occurred. If your office had bothered to consult with us in any way, you would know that it was their behaviour that was threatening to the rally participants and should be denounced. It is chilling to know that our concerns and our public safety are of such low importance to your office. We will be posting this letter on our website and will also post your response if one is forthcoming. You may have received a statement from Bnai Brith Canada about Pro-Palestinian protests over the weekend. Here is a statement from the Canada Palestine Association directed to the media after inquiries about the Bnai Brith complaint. Following is the text of our statement. We were not the organizers of a Saturday rally at the Vancouver Art Gallery, and we are not aware of what happened or may not have happened there as we did not attend. We did have a large rally outside the U.S. Embassy on Friday night that none of the media, including yourselves, reported on or chose to cover. That rally was organized by Canada Palestine Association, Stop War, and Independent Jewish Voices. 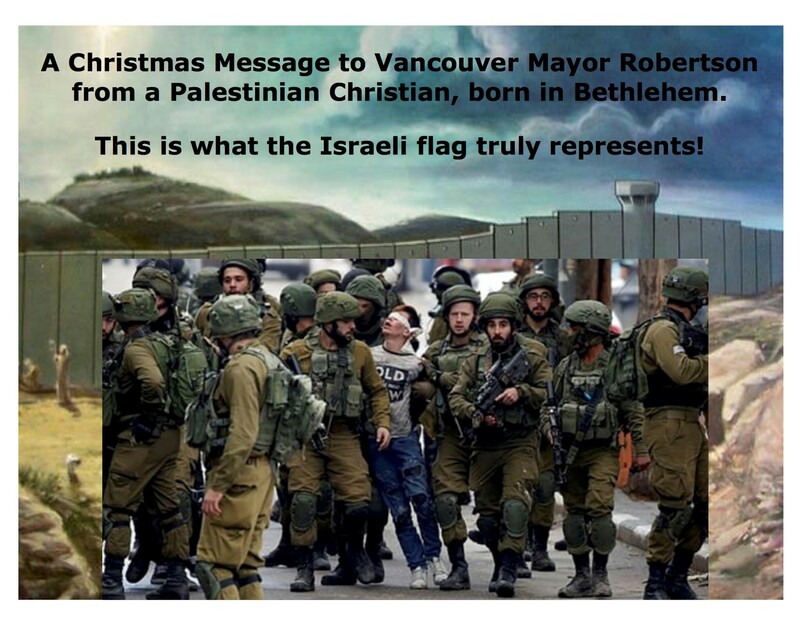 As for the general issue of burning the Israeli flag, we in the Canada Palestine Association-Vancouver would not consider this an anti-Semitic gesture. We do not equate Judaism with Zionism, nor do we equate all Jews with Israel. The Israeli flag represents the Israeli government, not all the Jewish people, and is being burned in many places around the world along with the U.S. flag. Is burning the U.S. flag anti-Christian or burning the Saudi or Iranian flag anti-Muslim? In fact, there is an Orthodox Jewish group, the Neturei Karta, that regularly burns the Israeli flag as a form of protest. Here they are in New York, Canada and Jerusalem. Is this also anti-Semitic? Additionally, it should be noted that for Palestinian youth in the occupied West Bank, for example, the Israeli flag on the military jeeps that come screeching into their villages and homes represents only one thing – brutal oppression. We feel the complaint you received is without basis, and is simply being used to obscure this latest infamy by both the U.S. and Israel against the legitimate and national rights of the Palestinian people. Furthermore, we find it distressing and ironic that your media only decides to pay attention to local Palestinian or pro-Palestinian protests when Israel advocacy groups or individuals make these unfounded complaints.